1. Sun Yat-sen University Cancer Center, No.651 Dongfeng Road East, Guangzhou, China. Background: The C-reactive protein/albumin (CRP/ALB) ratio has recently been associated with clinical outcomes in patients suffering various types of cancer. In this retrospective study, we investigated the prognostic value of the pre-treatment CRP/ALB ratio (CAR) in non-metastatic nasopharyngeal carcinoma (NPC) patients. Methods: The cohort included 2685 patients with non-metastatic NPC. Univariate and multivariate COX proportional hazards analyses were applied to evaluate the associations of CAR with overall survival (OS), distant metastasis-free survival (DMFS), disease-free survival (DFS), and locoregional recurrence-free survival (LRRFS) in patients with NPC. Kaplan-Meier survival analyses was used to compare groups classified by CAR. Results: Patients were categorised by the CAR using a cut-off value of 0.064. Multivariate Cox proportional hazard analysis verified that high CAR level was a significant predictor for inferior OS (P = 0.003), DMFS (P = 0.035), and LRRFS (P = 0.024), but not for DFS (P = 0.093). CAR was also an independent prognostic factor for OS when stratified by Epstein-Barr virus DNA level ( ≥ 2560 or < 2560 copies ml-1). Conclusions: High CAR provides prognostication regarding OS, DMFS, DFS, and LRRFS in patients with NPC. CAR is a valuable coadjutant for Epstein-Barr virus DNA levels for identifying survival differences. Keywords: Nasopharyngeal carcinoma, C-reactive protein, albumin, Epstein-Barr virus DNA, prognosis. Nasopharyngeal carcinoma (NPC) has a dramatically different geographical and ethnic distribution , with the highest incidence (i.e., 15 to 50 cases per 100,000 people) found in southern China . During the past decade, epidemiological trends have suggested that the incidence of NPC is gradually decreasing, even in endemic regions. Moreover, the mortality from the disease has declined substantially, likely due to the advances in radiation therapy (RT), which is the principle mainstay treatment approach . However, in some patients with NPC, distant metastasis and/or locoregional recurrence occurs within a few years after chemoradiotherapy . Thus, identifying prognostic factors for selecting patients with NPC for tailored treatment remains important. Traditionally, the tumour-nodes-metastasis (TNM) staging system has been the most commonly used prognostic tool . However, patients with the same clinical stage often present different clinical outcomes, indicating that TNM staging is insufficient for precisely predicting prognosis of NPC. Therefore, there is an urgent need for establishing easily determinable and cheap pre-treatment prognostic markers to stratify patients with NPC in terms of appropriate treatment approaches. Poor outcomes due to the presence of a systemic inflammatory response have been reported in patients with many types of malignancies . Therefore, in the last few years, the combination of inflammatory markers or inflammation-based prognostic scores, including the neutrophil lymphocyte ratio (NLR), platelet lymphocyte ratio (PLR) [7-9], lymphocyte monocyte ratio (LMR) , and prognostic nutritional index (PNI) , have been reported to have prognostic value in patients with various cancer. In addition, several studies have indicated that the C-reactive protein/Albumin (CRP/ALB) ratio is a risk factor for patients with hepatocellular carcinoma, oesophageal cancer, lung cancer, pancreatic cancer, and renal cancer [12-15], among others. But, whether the CRP/ALB ratio (CAR) is associated with outcomes in patients with NPC has not yet been elucidated. Therefore, in this large-scale, retrospective cohort study, we aimed to validate the prognostic significance of pre-treatment serum CAR for survival in patients with NPC. Between March 2000 and October 2013, the medical materials of 2685 patients who were newly diagnosed and received therapy at the Sun Yat-sen University Cancer Center (SYSUCC) in Guangzhou, China, were retrospectively reviewed. This study was carried out with the approval of the Institutional Review Board of SYSUCC and satisfied the need for written informed consent. The following eligibility criteria were used: (1) histologically confirmed, undifferentiated, non-keratinising squamous cell carcinoma; (2) no metastasis at presentation, no previous malignant diseases, and free of combined tumour; (3) no history of previous anti-cancer therapies; (4) no evidence of acute infection or chronic inflammatory disease; (5) complete records of pre-treatment haematological variables; and (6) complete follow-up data. The clinical stage was classified according to the AJCC/UICC tumour-nodes-metastasis (TNM) staging system (the 7th edition). Routine check-ups before treatment included serum biochemistry tests, fibre optic nasopharyngoscopy, nasopharyngeal and neck magnetic resonance imaging (MRI), abdominal ultrasounds, chest radiography, entire body bone scans, and/or positron emission tomography-computed tomography (PET-CT). Patients' medical histories were recorded, physical examinations were performed, and the TNM stage of disease was determined. The following information was gathered: clinical (age, gender, smoking status, clinical stage, T-stage, N-stage, family history of malignant tumours, radiotherapeutic technique, utility of chemotherapy), pathologic (pathological pattern), baseline laboratory data (CRP, ALB, EBV DNA copy number, lactate dehydrogenase [LDH], haemoglobin [HGB], numbers of neutrophils, lymphocytes, and platelets, among others). Blood samples were drawn routinely at the time of patient's first meeting at our department, before initiation of any diagnostic or therapeutic intervention. Plasma EBV DNA concentrations were routinely measured before treatment using real-time quantitative PCR, as described previously . The real-time quantitative PCR system was developed for plasma EBV DNA detection, and targeted the BamHI-W region of the EBV genome using primers 5′-GCCAGAGGTAAGTGGACTTT-3′ and 5′-TACCACCTCCTCTTCTTGCT-3′. The dual fluorescence-labelled oligomer 5′-(FAM)CACACCCAGGCACACACTACACAT(TAMRA)-3′ served as a probe. Sequence data for the EBV genome were obtained from the GeneBank sequence database. In total, 625 (23.3%) patients were treated with conventional two-dimensional (2D) or three-dimensional (3D) conformal radiotherapy (RT), and 2060 (76.7%) patients were treated with intensity-modulated radiotherapy (IMRT). The cumulative radiation doses prescribed were 66-72 Gy to the gross tumour volume, 64-70 Gy to the involved cervical lymph nodes, and 54-56 Gy to potential sites of local infiltration and bilateral cervical lymphatics, and finished within approximately 7 weeks. The dose received by each organ at risk (OAR) should less than its tolerance limit according to the RTOG 0225 protocol . Neoadjuvant or adjuvant chemotherapy consisted of cisplatin plus 5-fluorouracil, cisplatin plus taxane, or cisplatin plus 5-fluorouracil and taxane, every 3 weeks for two to four cycles. Cisplatin-based concurrent chemotherapy was administered weekly or every 3 weeks (weeks 1, 4, and 7 of RT). Newly, combined targeted therapy and/or radiosensitisation therapy was delivered to 215 (8%) patients when available. All patients were treated according to the standardisation of treatment for patients with NPC at the SYSUCC. Follow-up evaluations were performed every 3 months within the first 3 years, every 6 months for the following 2 years, and annually thereafter until death. The re-examined items during the follow-up were conducted by physical examination, nasopharyngoscope, nasopharyngeal and neck magnetic resonance imaging (MRI), chest CT, abdominal ultrasonography, bone marrow scan, EBV DNA copy number, and other haematological detections. The follow-up period was regarded from the date of first diagnosis to either the date of death or the date of lost to follow-up or January, 2016. Overall survival (OS) was our primary endpoint. Distant metastasis-free survival (DMFS), disease-free survival (DFS), and locoregional recurrence-free survival (LRRFS) were the secondary endpoints. OS was defined as the time from the date of first diagnosis to the date of death or to the last known date alive. DFS was the duration between the date of being diagnosed and the date of having events of locoregional recurrence and/or metastasis, or date of the last follow-up. LRRFS and DMFS were defined as the time from the date of first diagnosis to the date of first locoregional relapse and distant metastasis or censored at the date of the last follow-up, respectively. Descriptive characteristics of patients were recorded, categorical variables were presented as numbers and percentages, and continuous variables were allocated in groups according to the optimal cut-off value. The ideal cut-off value for the CAR and EBV DNA level were determined by receiver operating characteristics (ROC) analysis. At each value, the sensitivity and specificity was plotted, thus generating an ROC curve. The score closest to the point with both maximum sensitivity and specificity (i.e., the point [0.0, 1.0] on the curve) was selected as the cut-off value. Chi-square tests were used to analyse differences among groups of patients with elevated (E-CAR) or non-elevated CRP/ALB ratio (NE-CAR). The OS, DMFS, DFS, and LRRFS rates were calculated by the Kaplan-Meier estimates, and differences were tested by using the log-rank test. Statistical analysis was performed using IBM SPSS statistical program package, version 22.0, IBM Corp. All statistical tests were two-sided and a P value < 0.05 was considered statistically significant. A total of 2685 cases of non-metastatic NPC were enrolled. Patients were categorised into two groups based on their CAR: the NE-CAR group (CRP/ALB ratio < 0.064; n = 1663, 61.9%) and the E-CAR group (CRP/ALB ratio ≥ 0.064; n = 1022, 38.1%). Patients were also divided into groups based on their EBV DNA copy number, using a cut-off value of 2560 copies ml-1. Correlations of the pre-treatment CAR with the demographics and clinical characteristics of patients with NPC are listed in Table 1. An E-CAR was associated with age (P = 0.002), clinical stage (P < 0.001), T-stage (P < 0.001), N-stage (P < 0.001), EBV DNA copy number (P < 0.001), LDH (P < 0.001), CRP (P < 0.001), ALB (P < 0.001), neutrophil numbers (P < 0.001), and HGB (P = 0.003). The median follow-up duration for the whole group was 46.30 months (range, 0.07-188.43 months). Up to the last follow-up, 223 patients in the NE-CAR group and 220 patients in the E-CAR group died, while 396 patients in the NE-CAR group and 324 patients in the E-CAR group developed distant metastasis. Moreover, 303 patients in the NE-CAR group and 263 patients in the E-CAR group experienced locoregional failure. A summary of the follow-up data is shown in Table 1. Selected demographic data and baseline characteristics of patients with nasopharyngeal carcinoma (NPC). Abbreviations: NE-CAR: non-elevated CRP/ALB ratio (CAR < 0.064); E-CAR: elevated CRP/ALB ratio (CAR ≥ 0.064); 2DRT: two-dimensional radiotherapy; 3DCRT: three-dimensional conformal radiotherapy; IMRT: intensity-modulated radiation therapy; RT: radiotherapy; CT: chemotherapy. For the entire cohort, the 5-year OS, DMFS, DFS, and LRRFS rates were 82.5%, 71.8%, 67.6%, and 77.4%, respectively. The 5-year OS, DMFS, DFS, and LRRFS rates for the NE-CAR groups and E-CAR groups were 86.1% vs. 76.2% (P < 0.001; Figure 1A), 74.9% vs. 66.6% (P < 0.001; Figure 1B), 70.6% vs. 63.1% (P < 0.001; Figure 1C), and 80.8% vs. 71.7% (P < 0.001; Figure 1D), respectively. Multivariate analyses were performed to adjust for these related prognostic factors (Table 2). Consistent with the results of univariate analysis, CAR was found to be an independent prognostic factor for OS (HR, 1.360; 95% CI 1.11-1.654; P = 0.003). Additionally, when analysed as continuous variables, the ratio was an independent predictor for OS (HR, 1.342; 95% CI 1.176-1.531; P = 0.001), DMFS (HR, 1.187; 95% CI 1.012-1.391; P = 0.035), and LRRFS (HR, 1.230; 95% CI 1.028-1.472; P = 0.024), but not for DFS (P = 0.093). A subgroup analysis of all patients was conducted stratifying by pre-treatment EBV DNA copy number, with EBV DNA levels<2560 copies ml-1 (Pre-L group) and ≥2560 copies ml-1 (Pre-H group). In both the pre-L and pre-H groups, CAR was identified as an independent prognostic factor for OS (HR, 1.686; 95% CI 1.219-2.333; P = 0.002) and (HR, 1.376; 95% CI 1.192-1.589; P < 0.001) using multivariate analysis. In the pre-L group, patients with an E-CAR had worse OS than patients with a NE-CAR (Log-rank, P < 0.001; Figure 2A). In the pre-H group, higher survival time was also seen in the NE-CAR group (Log-rank, P < 0.001; Figure 2B). To the best of our knowledge, this was the first study to analyse the correlations between CAR and OS, DMFS, DFS, and LRRFS in patients with NPC. The outcomes of this retrospective study showed that CAR was an independent prognostic parameter for patients with NPC. In addition, our results on CAR further validate the connection between inflammation and the development and progression of tumours. Although many studies over the past decade have given insight into how inflammation specifically contributes to tumourigenesis, the precise mechanisms remain to be deciphered . Inflammation is known to contribute to carcinogenesis by inducing epigenetic changes and genomic instability . Furthermore, some convincing studies demonstrated that anti-inflammatory drugs, such as NSAIDs, are associated with the reduced risk of several different types of cancer . Chronic inflammation may not initiate tumour growth, but rather provide an appropriate environment to facilitate tumour progression and metastasis . As a sensitive and undeniable prognostic marker for systemic inflammation, CRP has been shown to be significant in the prediction of outcomes of head and neck squamous cell carcinoma , oesophageal squamous cell carcinoma , pancreatic cancer patients , and metastatic nasopharyngeal carcinoma . The production of CRP by the liver is strongly induced by cytokines (including interleukin-1, interleukin-6, and tumour-necrosis factor), which recruit and suppress anti-tumour immune cells . CRP is also induced by infection, trauma, and in particular, tumour necrosis . Furthermore, changes in the inflammatory tumour microenvironment influenced by the CRP can promote tumourigenesis and tumour progression . 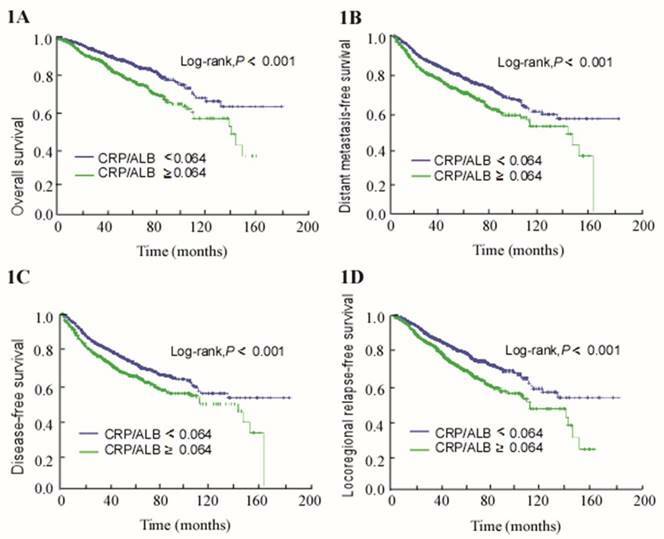 Kaplan-Meier survival curves for patients with CRP/ALB ≥ 0.064 and patients with CRP/ALB < 0.064. (A) Overall survival. (B) Distant metastasis-free survival. (C) Disease-free survival. (D) Locoregional relapse-free survival. Kaplan-Meier curves of overall survival (OS) by combining pre-treatment EBV DNA and CAR levels in patients with NPC. (A) EBV DNA < 2560 copies ml-1. (B) EBV DNA ≥ 2560 copies ml-1. Univariate and multivariate analyses of overall survival (OS). Abbreviations: HR: unadjusted hazard ratio; CI: confidence interval; *CAR: CRP/ALB ratio, **Continuous: CAR as a continuous variable; Multivariate analyses adjusted for age, smoking status, clinical stage, T-stage, N-stage, treatment, radiotherapy technique, EBV DNA copy number, LDH, neutrophil number, haemoglobin, CAR, and CAR (continuous). Prior studies have shown that low serum ALB, which is also an inflammatory index, was an independent prognostic factor of poor survival in several types of cancers, including gastrointestinal cancer, lung cancer, as well as NPC . Lowered concentrations of ALB are usually seen in acute and chronic disease. Such lowered concentrations of ALB may increase vascular permeability and cause microenvironmental variations, thereby leading to tumour progression . Further evidence that both CRP and ALB were markers associated with inflammation was provided by a prospective observational study conducted in 2000 . It is likely that combining CRP and ALB to create a new marker (CAR), which considers the interlinkages between CRP and ALB, is theoretically more convincing for predicting the survival of patients with cancer. Indeed, some researches indicate that elevated CAR is a predictor of poor prognosis in various cancers [12-15]. Based on the above evidence, we hypothesised that CAR could be a prognostic factor for patients with NPC. We confirmed that the E-CAR was independently associated with poorer survival prognosis in patients with NPC. In nearly all the NPC prognostic models, EBV has been identified as a distinguishing factor. EBV DNA replication has attracted numerous studies of NPC prognosis and treatment, although the natural role of EBV in NPC pathogenesis is not yet fully illustrated. An et al. reported that the high-risk group of patients with advanced NPC, grouped by plasma EBV DNA, require more intense treatment [31, 32]. Therefore, we carried out an exploratory stratified sub-analysis based on pre-treatment EBV DNA levels. Significant differences of initial CAR and OS were observed in both groups, especially in the high EBV-DNA groups. Notably, patients in the high EBV DNA subgroup with E-CAR had a worse OS. These results indicate that determining EBV DNA levels alone may be insufficient to complement the TNM classification, and CAR should be added to predict the prognosis of patients with NPC. This study provides further support that elevated pre-treatment CAR levels represent a poor prognostic serological marker for survival in patients with non-metastatic NPC. Due to the advantages of simplicity, commercially available, reproducibility, and speed, the use of the CAR marker may easily be established in modern intensive care. However, future randomised clinical trials are required to further stratify whether serum CAR could instruct individualised treatment for patients with NPC. In addition, a potential limitation of the current study is that it was a retrospective, single-centre study. Although the multivariate analysis showed the CAR to be an independent predictor for survival, its value is restricted due to the retrospective study design. Therefore, the results must be replicated in multi-centre and prospective studies. Moreover, CRP and ALB are known to be non-specific markers of inflammation. Therefore, the presence of other systemic diseases could influence CRP and ALB concentrations in the serum. However, we excluded patients in this study with other diseases or traumas, which could potentially cause inflammation. The use of CAR together with other established predictive scores (such as the NLR, PNI, LMR, Glasgow Prognostic Score [GPS], modified GPS [mGPS], and so on) may provide firmer evidence for novel treatment strategies. Although, future clinical trials are needed to determine whether these inflammatory scores could be incorporated in cancer staging systems to serve as a target of exploitation in a therapeutic capacity. Using such prognostic factors, we may be able to establish a prognostic nomogram model to predict the survival of patients with NPC and even demonstrate a cohort to receive an external validation. In summary, an initial elevated CAR is associated with reduced survival and is considered to be an appropriate predictor for poor outcome in patients with non-metastatic NPC. Due to the fact that the ratio may enable more detailed prognostication, it would be beneficial to take the CAR into consideration when conducting risk stratification and for selecting the therapeutic strategy. This work was supported by a grant from the Natural Science Foundation of Guangdong Province, China [No. 2016A020215083]. The funding agency had no role in the study design, data collection and analysis, decision to publish, or preparation of the manuscript. Corresponding authors: Yong Chen, M.D. ; Lixia Lu, M.D., PhD; Sun Yat-sen University Cancer Center, State Key Laboratory of Oncology in South China; Collaborative Innovation Center for Cancer Medicine, Department of Radiation Oncology, Guangzhou 510060, People's Republic of China. Telephone: +0086-020-87343505, E-mail: chenyongorg.cn; lulxorg.cn.